It is inevitable with the extra socialising that the run up to Christmas can get messy! I was delighted to be sent a selection of Dr. Beckmann stain removal products to review. They have already come in so handy. There is enough stress as we approach Christmas. So its nice having products like this to make sure I can cope with any stain emergency! The Stain Devils Push & Wipe product is perfect to carry in your handbag! You just click down and wait for 10 seconds for the wipe nestled inside to soak up all the liquid! Then it pops out fully when its ready. It’s so convenient, like nothing I have ever seen before. I love that it’s so portable and can save your party frocks when food or wine is split! When you have a spill, you need to act fast to stop it setting in so having a stain removal product on the go is a revelation for me! I don’t know how I have survived so long without it. My clothes will breathe a sigh of relief as I do tend to make a mess. At only £2.50 from Tesco they are a bargain too! That will give you peace of mind when you are out partying or when the kids spill a hot chocolate at Santa’s grotto. We also had the Stain Devils Survival Kit (RRP £3.99) this is handy to have at home it can remove over 40 stubborn stains. It’s a cupboard essential to ensure you can target any stain that Christmas throws at you! 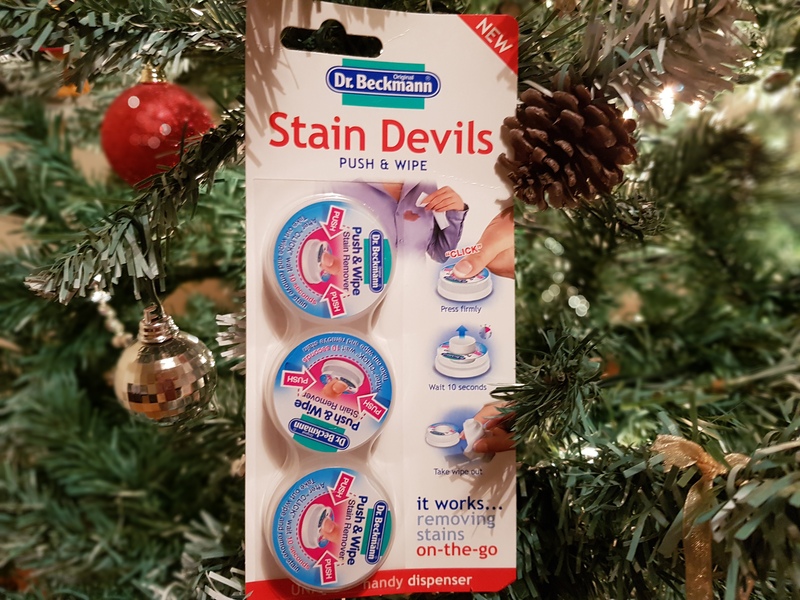 Whether its ink spilt whilst writing Christmas cards or mulled wine on your top panic not Dr. Beckmann will save your clothes and Christmas in the process! Don’t be afraid to let the kids decorate their own Christmas cards they love getting creative and the Ballpoint Ink & Felt Tip bottle can tackle crayons, glue and watercolours too! The Carpet Stain Remover product (RRP £3.59) is a godsend especially if you live in rented accommodation and worry about throwing a Christmas shindig in case you ruin the carpet! I think it’s such a bargain at that price especially as it includes the helpful brush head to make sure you banish that stain for good! This product has been awarded Which? best buy for four consecutive years and I can completely see why. The oxy powered formula teamed up with the cleaning brush gets deep into the stain, so you can relax and really enjoy the festive season! It can also eliminate odours handy if like us you have a dog that can occasionally have a little wee when she gets very over excited about visitors in the house. You don’t have to be embarrassed as it will leave a fresh scent instead. I am so glad I can rely on these high performing products to take the anxiety away from Christmas entertaining. We own our own property, but I still like to think our rugs and furnishings will stay in good condition. I might not answer to a landlord, but I can be quite tough on myself! With these products safely stored for stain emergencies I am happy to fill the house with people, so we can really celebrate this Christmas. The caroet stain remover would be helpful to use in our house. Especially the stairs as having a dog and a toddler you can imagine the mess they create walking up and down! I need to get these stain removal products for myself too. These would be really helpful in clearing the mess. I love Dr Beckmann products! There really good at getting out tough stains – even fake tan ones!